If you're still pondering over the hidden messages in Stanley Kubrick's The Shining, good news — the documentary Room 237 is coming to help sort it out. The film, directed by Rodney Ascher, examines many of the film's potential meanings with scholars, enthusiasts and a great deal of archival footage of Kubrick's masterpiece of horror. This newest poster — exclusively revealed to io9 — features a bleak rendition of the "Calumet Baking Powder" cans Kubrick very surreptitiously put in the Overlook Hotel's food-locker scenes, which hint at the film's possible examination of the destruction of Native Americans; you'll have to watch Room 237 to find out more about the theory, but suffice it to say it'll blow your mind. The movie will open theatrically on March 29th, and will also be available on VOD, SundanceNOW, and other digital outlets beginning on the same day. 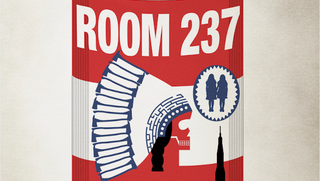 You can get more information about Room 237 at the documentary's official website, here.